On the 21st of March, Varsity against Royal Holloway, University of London, was held for the second year in a row. While the rest of Team Surrey headed to Holloway to compete there, for logistic reasons, USBC welcomed Royal Holloway Boat Club on our home stretch in Molesey. Racing was held between two novice crews in order to get them used to side-by-side racing. After Royal Holloway arrived, they were introduced to the course and the facilities. The race was held over a distance of just over 1km, on the Molesey Regatta course. The men’s novice eight were the first ones to race. 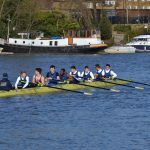 Lukas Schroth, Roberto de Isidro, Ben Radcliffe-Brown, Wilson Sandengu, Chris Homes, Zak Evans, Abdel Abdalla and Wei Shen Chin started their warm-up followed up the river by their competitors. They were pushing away from them and did several bursts on the way up to the start line. 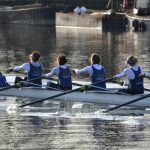 Coxed by Anika Piezka, it was their first experience of side-by-side racing. In addition, the race was started with a racing start which they had not previously done in competitions. Anika Piezka said about the race: “Surprisingly, as it was the first time they had ever done a proper racing start, they started off the race very well and it came very naturally. Within the first 4 strokes we pulled away from Royal Holloway. The race was very high paced but the men settled into a very strong and long rhythm all the way. 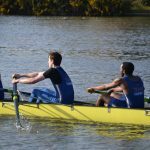 Even though we were far ahead of our competitors, the power and determination in the boat didn’t drop.” The race was clearly won by USBC, marking the first win for the men. They were delighted with the result and gained a lot of confidence from it. After a quick change of boat, the novice women’s eight was ready to compete. Also coxed by Anika Piezka, they did a similar warm-up to the men, with bursts on the way to the start, setting them up nicely for the race. 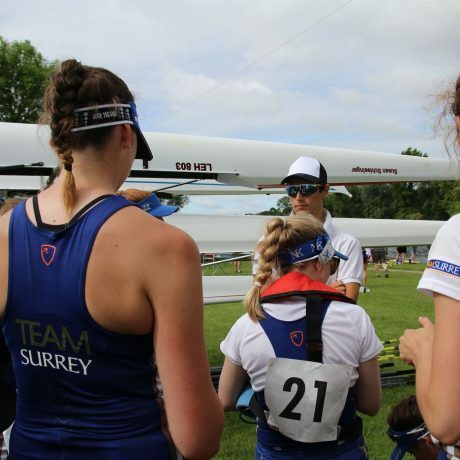 Maddy Brown, Lizzie MacCann, Abbie Cook, Fiona Norris, Lana Dehoop, Melissa Johnson, Molly Ryan and Elisavet Palaiologou were excited to race, as it was the first race experience for three of the girls. Even they did a strong racing start, leading them to settle into a good rhythm nicely for the race. They started pushing away from Royal Holloway within the first quarter of the race. Accompanied by cheers on the bank from the rest of the squad, they pushed on strongly and clearly won the varsity race as well. They were very happy about that result, marking an overall win of USBC over Royal Holloway in the rowing competition. 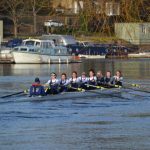 Overall, Team Surrey won varsity 2018 and our crews were delighted to have been part of this, marking their first side-by-side experience and setting them up for the upcoming regatta season.